Today Junior Achievement announced the winner of the third year Social Innovation Relay, a global competition organized in collaboration with HP that challenges secondary school students to develop an innovative business concept that addresses a social need. Youth Innovators from India won the competition. 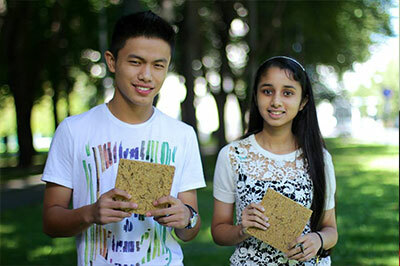 Under the guidance and support of an HP e-mentor from Singapore, the team developed a revolutionary building material, made out of rice husk boards. The team will buy rice husk from farmers and create a building material, which they called “Green Wood”. The runners-up in the competition were Cyan, from Malaysia, who proposed a solution to battle mosquito-based diseases and Hospitaleiros, from Brazil, who developed a concept for an application for information on medical services in Brazil. “A trip to my farm house made me observe the burning of rice waste was causing air pollution, which inspired me to come up with an idea that solves this problem,” shared Bisman Deu of the Youth Innovators team. “Our society has given us a lot and I strongly feel that now it is time to give back. As Indian youth and global citizens we have immense responsibility,” added Ekambir Singh, Finance and Marketing Strategist of the Youth Innovators. The winners will be joining the JA-YE Europe 10th Alumni Conference in Talin, Estonia in August 2013. Access to technology is crucial to enable students to be successful in the labor market of the 21st century. Globally, a large number of students do not have this access which puts them at risk for unemployment even before they have entered the labor market. The Social Innovation Relay seeks to close this gap by bringing innovative technology and hands-on educational programs to schools, equipping students with technological and entrepreneurial skills to succeed in school and beyond. At the EU Summit on 27-28 June EU leaders sent a strong message that tackling youth unemployment must become a top priority for EU member states with a focus on strengthening cooperation between business and educators and promoting apprenticeships, entrepreneurship and start-ups. “The goal of the Social Innovation Relay is to prepare students with the entrepreneurial and ICT skills they need to succeed in the 21st century economy. This year’s exceptional entries prove that with the right guidance and resources, today’s youth has the power to tackle some of the world’s biggest challenges.” Caroline Jenner, CEO Junior Achievement Young Enterprise (JA-YE Europe). The Social Innovation Relay provides young people with the hands-on skills and entrepreneurial expertise needed to start a successful career through a combination of virtual and face-to-face mentoring by experienced executives. The participating teams are paired with e-mentors who are all HP employees and who connect with the finalists to help them develop concept papers that can translate in feasible business ideas. “The quality and increasing number of innovative, socially orientated business ideas reflects a successful collaboration with HP mentors and our partner Junior Achievement. The Social Innovation Relay is part of HP’s commitment to apply our expertise and technology to enable students to develop IT and business skills and solve societal issues, leading to a future with many more bright social minded entrepreneurs. ” Jeannette Weisschuh, director, Global Education Programs, Sustainability and Social Innovation, HP. The Social Innovation Relay was first launched in 2010, and over the past three years more than 67,000 students and 800 HP mentors from 19 countries have participated, submitting their socially innovative concepts. This year, nearly 1,600 teams around the world registered for the relay showcasing an ever increasing interest in the initiative around the world. See a full list of the 2013 Finalists here. HP plays an active role in these programs and goes beyond traditional corporate sponsorship by not only donating funds and equipment, but also tapping into its vast technology expertise and mobilizing members of its more than 300,000-employee workforce to participate via mentoring and volunteering. The Social Innovation Relay is aligned closely to another HP flagship program, the HP Learning Initiative for Entrepreneurs (HP LIFE). This free, on-line learning platform supports new and aspiring entrepreneurs around the world to create and build their business. www.life-global.org.